3 Kinds of Peas & Strawberries; Onions & Garlic! Mesa Harmony Garden could use your VOTE! They are in line for a $10,000 award from RainBird, to install water wise systems in their 3-phase Food Forest installation! It’s an awesome project in Santa Barbara CA, turning unused land into a model garden, to produce food for the Food Bank – the highest % of that goes to seniors and kids. You can vote every day if you are willing, and it is sure appreciated! http://www.iuowawards.com/Projects.aspx#search Blessings! November things to know about your veggies! Go vertical! Set up a trellis. Get your peas. 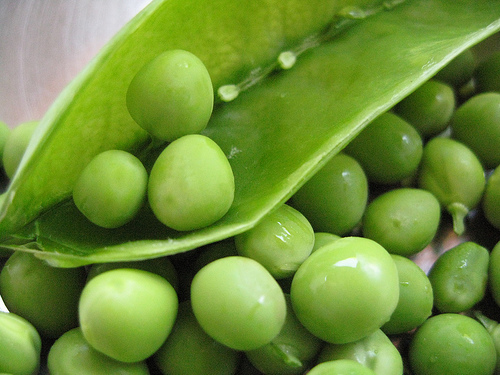 There are 3 kinds of peas – English shelling peas, Chinese snow peas, fat crunchy eat-‘em-off-the-vine snap peas! I plant and enjoy them all! Stringless is nice. Mildew resistant is great! At this time of year, plant from transplants. Or. Put in some from transplants at the same time as you put in some seeds. That is equivalent to about a 6 week succession planting pattern. Now through February, plant peas every month for continuous crop. Inoculate your seeds if you haven’t grown peas there for the last 3 years. If you had an area where peas grew well last year, grab some handfuls of that soil and put it where you are planting this year! Rhizobia makes for abundant production. Just sprinkle it on the seeds when you plant! At Island Seed & Feed, one T of inoculant for 6 LBS of pea seeds is only $2! It’s where the bulk seeds are. No manure, or very lightly, for peas, they make their own N (Nitrogen). That’s what legumes do! Peas germinate well at 40 to 75 degrees F, but the colder, the slower. Pre-sprouting is fair, in fact, makes sense! Sprouted seed will grow in soils too cool for germination. YES! Don’t you love it?! Easy peasy has true meaning here. Wet a paper towel on a plate, arrange your seeds on one half of the towel, not touching each other, fold the other half over. Put them in a zip plastic bag, seal. Put on a spot that maintains about 70 degrees. Check those pups daily, add a wee bit of water, spray the paper towel, if needed. Your peas will sprout in 4 or 5 days! 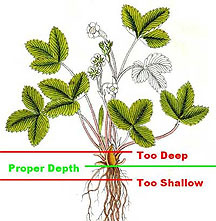 Soon as they sprout, put them carefully into the garden, right below the soil level. Gently firm the soil so they have good contact. If any fail, start another round to fill the gaps. Space your pea babies about 2 inches apart. If you are putting in seeds, put them in about an inch apart, then thin when they are of a likely height that looks like their survival is assured. Birds? If those walk-abouts are a bother, get some of that garden netting, or lay or prop those narrow patterned plastic plant flats over them. 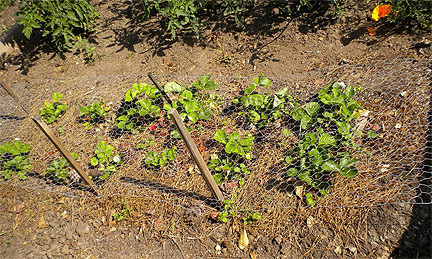 When you aren’t using the netting on your peas, in spring & summer use it to cover your strawberries. Water. They like it. Every day until seeds are germinated, then once a week deeply. Now we are back to the trellis. When your plants are 1 foot to 1 ½ feet high, start weaving twine through/around them to secure them against winds and rain-heavy weight. Those cute little tendrils just aren’t enough to hold them. Before wind, rains, are predicted, check everybody to be sure all is secure. Stinky Onions?! You bet! Onions are sensitive to temperature and day length, photothermoperiodic! Whew! They start bulbing only after enough daylight for a certain number of days. To avoid bolting, in SoCal we need to plant seeds of short day onions in fall, or intermediate varieties in late winter. Most sets are long-day types and won’t work. Plant Grano, Granex, & Crystal Wax seeds in the ground Nov 1, today, to Nov 10, or bare root in January. Granex stores a little better, all of them are sweet like Vidalia and Maui. If you miss this window, plant intermediate onions in Feb. Onion seeds sprout very easily! Garlic is so easy – separate the cloves, plant in full sun, about 1 to 2 inches deep in rich humusy soil, points up, 4 inches apart. That’s it! Water and wait, water and wait…. Strawberries Anytime! But which kind? There are 3 types of strawberries. 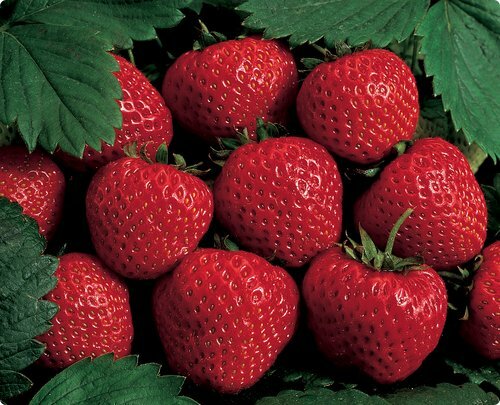 Deciding on whether to plant June Bearing, Everbearing, or Day Neutral strawberries depends on your available space, size of preferred strawberries and how much work you want to put into the strawberries. June Bearing, mid June, strawberries produce a nice, large and sweet berry. Because they only produce for 2 to 3 weeks, there is not so much work to take care of them. You do, however, need space because of the runners. They are classified into early, mid-season and late varieties. ♦ Chandler, large, high yield, large quantities of small fruit later in season ♦ Short day, Camarosa is large. It can be picked when fully red, and still have a long shelf life. This variety represents almost half of California’s current commercial acreage. ♦ Short day, Oso Grande is a firm, large berry, with a steadier production period than Chandler.